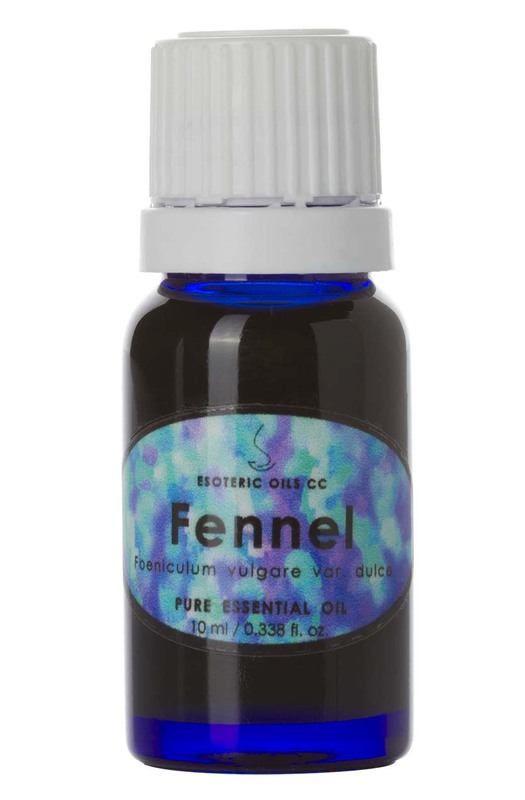 Our fennel essential oil is extracted from Foeniculum vulgare var. dulce, which is sweet fennel (also known as F. officinale, F. capillaceum and Anethum foeniculum) of the Umbelliferae (Apiaceae) family and is also known as fenkel and Roman fennel. This essential oil is used in aromatherapy to boost your courage, resolve and strength in the face of adversity, while helping a huge array of digestive problems, fighting obesity, clearing an oily skin and fighting wrinkles. Fennel oil has a herby, slightly spicy smell, much like aniseed and it is clear in viscosity. The name is from the Latin word 'foenum' which means 'hay'. It grows up to 2 meters (6 feet) in height and is a biennial or perennial herb, with green feathery leaves and golden yellow flowers, that bees like. In Medieval times it was known as 'Fenkle' and was a very popular herb with the ancient Chinese, Egyptians and Romans, who believed it conveyed longevity, courage and strength, as well as warding of spirits. Not only did they use it to strengthen eyesight, but they also used it for snakebites, colic and to rid dogs of fleas. Sweet fennel oil (the one we sell) is extracted from crushed seeds by steam distillation and yield 2 - 4 %. Bitter fennel oil, not used for aromatherapy, is extracted from the crushed seeds and/or the whole herb of the Foeniculum vulgare var. amara plant. The main chemical components of fennel oil are a-pinene, myrcene, fenchone, trans-anethole, methyl chavicol, limonene, 1,8-cineole and anisic aldehyde. Bitter fennel (not sold by us) is not used in aromatherapy and should not applied to the skin at all. The therapeutic properties of fennel oil are aperitif, antiseptic, antispasmodic, carminative, depurative, diuretic, emmenagogue, expectorant, galactagogue, laxative, stimulant, stomachic, splenic, tonic and vermifuge. It has a toning effect on the spleen and liver, that helps with the results of excess drink and food. It is also used for increasing insufficient milk in nursing mothers - but for boosting breast milk, rather use the fresh herb, since the oil contains very high concentrations of trans-anethole. Fennel oil's greatest benefits lie in its easing of the digestive system, helping with obesity and toning the skin. Fennel oil can be used as a blended massage oil or diluted in the bath for helping to fix a bloated stomach, excess wind, colic, constipation and other digestive problems. It also acts as a diuretic, to remove excess water and to start breaking down cellulite. Used in a base cream or lotion, fennel oil can be helpful for general skin care and especially for dispersing bruises, livening a dull complexion, clearing an oily skin and fighting wrinkles in mature skins. It is also useful for removing cellulite, to fight rheumatism and helps with edema. It blends well with geranium, lavender, rose and sandalwood.